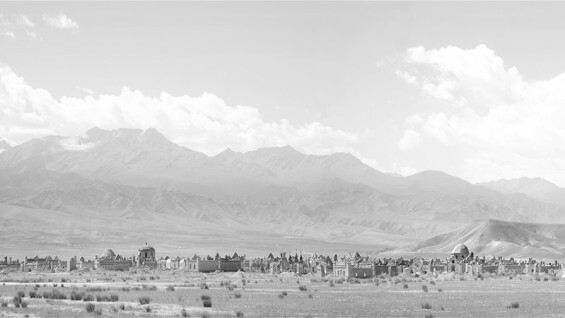 Held in conjunction with the exhibition Cities of the Dead: The Ancestral Cemeteries of Kyrgyzstan, this event will be comprised of a talk by photographer and Cooper Union School of Art professor Margaret Morton on her in-depth study of this often-overlooked culture and tradition. Architect and a historian Nasser Rabbat, the Aga Khan Professor and director of the Aga Khan Program for Islamic Architecture at MIT, will also give a talk entitled The Commemoration of Death in Islam. A discussion between Morton and Rabbat will follow. Traveling in the Central Asian country of Kyrgyzstan, Margaret Morton became captivated by the otherworldly quality of the local cemeteries. Her expert eye captured the diverse influences at play in this mountainous region. Architecturally distinctive, Kyrgyzstan’s dramatically sited cemeteries reveal the complex nature of the Kyrgyz people’s religious and cultural identities. The elaborate tombs combine earlier nomadic customs with Islamic architectural forms. After the territory was incorporated into the Russian Empire, enamel portraits for the deceased were attached to the monuments. Yet everything within the walls is overgrown with weeds, for it is not Kyrgyz tradition for the living to frequent the graves of the dead. A critically acclaimed photographer, Margaret Morton is a professor of art at The Cooper Union. She is the author of four previous photography books exploring alternative built environments: Fragile Dwelling; The Tunnel: The Underground Homeless of New York City; Transitory Gardens, Uprooted Lives (with Diana Balmori); and Glass House. Nasser Rabbat is the Aga Khan Professor and the director of the Aga Khan Program for Islamic Architecture at MIT. Professor Rabbat is an architect and a historian, and his scholarly interests include the history and historiography of Islamic architecture and cultures, urban history, and postcolonial criticism. His most recent books are: Al-Mudun al-Mayyita: Durus min Madhih wa-Ru’an li-Mustaqbaliha (The Dead Cities: Lessons from Its History and Views on Its Future) (Damascus, 2010), Mamluk History through Architecture: Building, Culture, and Politics in Mamluk Egypt and Syria (London, 2010), and an edited book, The Courtyard House between Cultural Reference and Universal Relevance (London, 2010). A forthcoming book, al-Naqd Iltizaman (Criticism as Commitment), will be published in 2014 in Beirut.